For years, Steam, Valve’s online PC gaming store, has ruled the market. Combining an enormous catalog of games with absurd seasonal sales (up to 90% off! ), Steam is the go-to store for PC gamers. In the past two years, Valve has made a huge push into hardware, providing a custom gaming OS, Steam OS, to computer manufacturers in exchange for them making “Steam Machines”, computers designed with the intention of being used exclusively for gaming like consoles. This year, Valve has made PC gaming from your couch even easier, with the release of the Steam Controller. 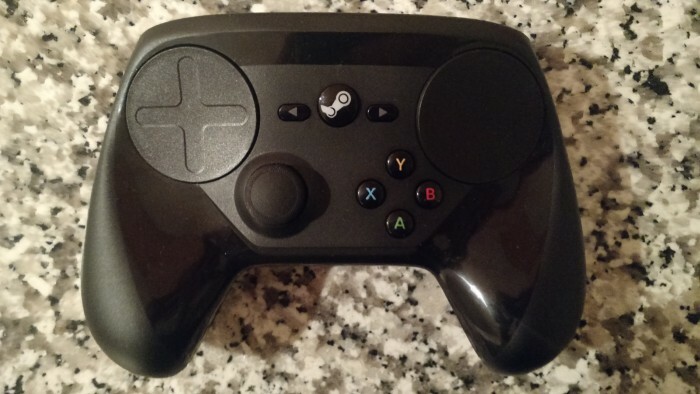 The Steam Controller is a USB powered controller. It’s similar to a PS4 or Xbox One controller: analog stick, d-pad, triggers on the top, and a diamond of 4 buttons labeled A, B, X, Y. However, it has several key modifications that set it apart from the standard controller layout. The biggest change is replacing a typical right analog stick and the d-pad with circular trackpads, like a laptop’s. Valve has also added a third trigger to complement the two along the top, located behind the controller on the grips. I recently received a Steam Controller, and have used it for the last week with my laptop, since I’ve been visiting family and don’t have my desktop computer with me. The Steam Controller has been a huge boon, allowing me to play all the games I don’t even attempt to play on a trackpad and laptop. Granted, the same could be said of other controllers, so let’s get into some of the perks of the Steam Controller. Customization – The amount of customization this controller allows is incredible. 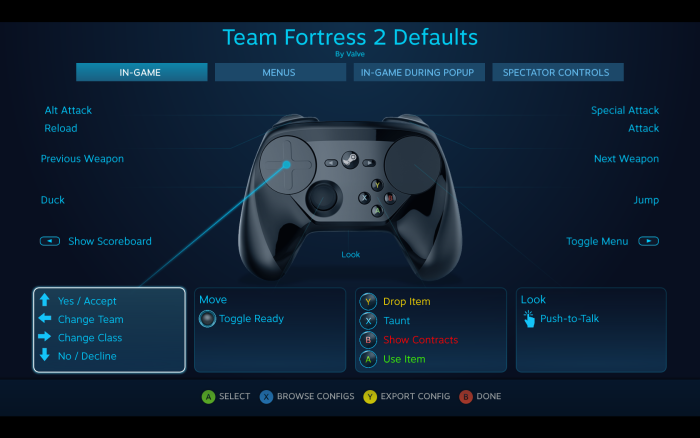 Game developers have the option to provide a Steam controller layout themselves, which can be tweaked and adjusted to suit your own play style. Custom setups can be saved, and the Steam community’s layouts can be browsed and tested and modified. Valve also provides some default templates for games: one for a typical controller, one for a typical controller but with higher precision (for FPS or similarly precise games), and one for a keyboard and mouse driven game. Once in the customization menu, you can map each of the controller buttons and touchpads to any key or controller inputs. So a mapping could have an analog stick for moving, with the bumper buttons on the top used for switching between modes / weapons. The level of customization is absolutely insane. With the amount of control Valve gives to you, practically any game can be played on the Steam Controller. 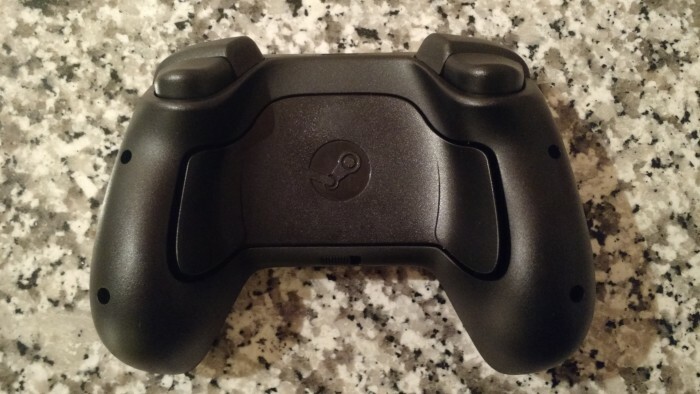 Grip triggers – With the Steam Controller, Valve has actually added a completely new button to the standard controller design that is easily accessible and incredibly useful. Two grip triggers sit at my fingertips when holding the controller normally. To activate either, I just squeeze a little bit tighter. It’s fantastically simple, and I can’t believe it hasn’t been done before. For example, it could be mapped to a rear-view camera view in a racing game, allowing the player to quickly check behind them and then return to driving. Touchpad – The replacement of an analog stick with a touchpad is a huge risk on Valve’s part. While at first it was difficult to adjust to, it’s a huge improvement for navigating games not designed for use with a controller. Even with controller-friendly games, navigating menus is often easier with a touchpad. In-game, it takes some getting used to, since analog controllers are typically used all-or-nothing, while the touchpad feels far more sensitive. However, when used with the gyroscope, once you’re adjusted to the drastically different control scheme it feels fine. Gyro – Hidden within the Steam controller is an incredibly accurate gyroscope that maps along four directions. It can easily be used to aim or turn, simply by moving the controller itself. One of the features the community has started to use is that the gyro can be set to only be functional when a certain button is pressed, or if a touchpad has a finger on it. The community has jumped on this in FPS games. With a finger on the right touchpad for general aiming, players use the gyro to do the precisely-tuned aiming integral to FPS games. It take a while to get adjusted to, but once you do it feels stellar and more precise than an analog stick (although still not superior to a mouse and keyboard). Haptic feedback – This is my only real dislike on the controller. Haptic feedback can be great, but I really was not impressed with the Steam controller’s feedback. The first game I played with the controller didn’t have any haptics, so when I started up one that did, I started freaking out because every time I moved on the touchpad it sounded like something had broken in my controller. It’s a very grindy sound, and not one that inspires, “Oh, I am definitely moving my finger on the touchpad!” The nerve center for the feedback feels like it’s not behind the actual touchpad, but somewhere in the center of the controller. It’s a really disconcerting feeling. I’ve toyed with the three levels, but none of them really feel like genuine feedback at all. I’ve ended up disabling the feedback on any game I’ve found that uses it, which was more difficult than expected the first time I tried to turn it off. The new Steam controller software hides haptic feedback behind a legacy settings option. I’d suggest giving it a try, but don’t be afraid to turn it off; you’re not missing out on much. One thing that could improve the haptic feedback was if there was a way of incorporating it into the games themselves, as a rumble feature. Perhaps an update in the future will add this functionality for developers to tie their games into. Software – With some of the games I tried (Team Fortress 2, CS:GO) I found that some of the controller configurations just wouldn’t work. While every option looked set up, the game refused to recognize the controller inputs. This even included the developer-sanctioned controller layout for CS:GO. It turns out that for some reason, there’s some configurations that will only work if you are using the Steam Beta (Steam -> Settings -> Beta Participation). However, this is not documented anywhere. If you’re struggling to get your controller to work in-game, try opting into the beta. However, in doing so, you also opt into the Steam Controller software beta. I dislike how there is zero display of this issue, and that the only fix is to opt into a beta program that may feature less-than-perfect software and firmware. Ultimately, the Steam Controller is a solid PC controller. It surpasses the typical gamepad controller with the touchpad inputs and grip triggers. With the use of the gyro, the controller is able to be incredibly precise in-game. With the ability to customize every aspect of the controller and its inputs, a gamer who loves to tinker and make everything perfect will fall in love all over again with the Steam Controller. It’s not a perfect replacement for a mouse and keyboard, but is great for people who want to use a controller from the couch or their bed instead of trying to use a wireless keyboard and mouse. 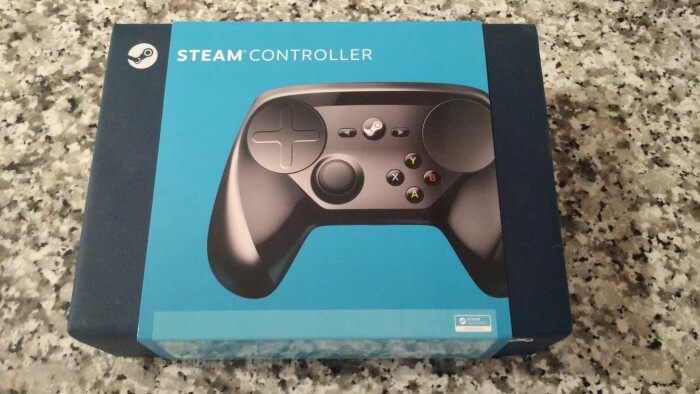 The Steam Controller is available on Amazon and on Steam.